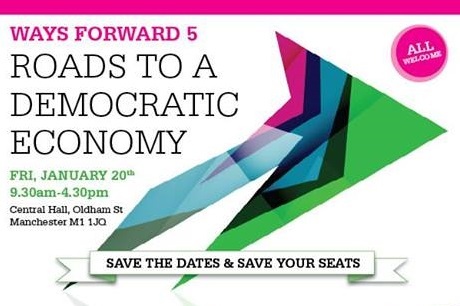 On Friday 20 January we’ll be heading up to Manchester for the Ways Forward 5 Conference: Roads to a Democratic Economy. We’re one of the key sponsors of the conference, which is about discussing co-operative and radical alternatives to austerity and capitalism and will debate a range of topics, from ‘global alternatives to global capitalism’, to ‘local assistance for co-operative development’. We’ll have a stand at the event, so if you’re interested in chatting to us about the Solidarity Economy do come and find us. We’ll be sharing our stand with the Stir to Action team, who will have copies of our special, collaborative Winter issue, all about the Solidarity Economy Movement. If you’d like to find out more about the magazine, you can read our related blog post or visit the Stir to Action website to grab yourself a copy before then. One of the many reasons why events like Ways Forward 5 are so important is that they provide an opportunity to share experiences and different perspectives of how the solidarity economy movement is growing all over the world, and why it’s needed now, more than ever. One of the workshops on the day will be Rojava: War zone co-operative economies, and will be an opportunity to hear from speakers Ercan Ayboga and Jo Magpie about the ways co-operatives are helping to rebuild Rojava, the democratic, autonomous region of Northern Syria. In Rojava (and also Bakur, the mainly Kurdish region lying within Turkey’s borders) the co-operative movement is growing; co-operatives are seen as an integral part of democracy and vital to the development and integration of different parts of society. Some incredible progress is being made, but few people are aware of it due to a lack of written evidence; both Jo Magpie and Ercan Ayboga have been working to address this lack of awareness in different ways. Jo as part of our project, and Ercan through the fantastic book he has co-written, Revolution in Rojava, which gives a clear and readable overview of the history and ideology of the Kurdish Freedom Movement and how it is re-shaping Rojava in North Syria. This workshop is a great chance to hear more about what’s happening in Rojava and to join in the discussion at the end of the workshop. You can also read more about it in our special issue of Stir magazine. So, if you haven’t got your ticket yet there’s still time, and everyone is welcome – we look forward to seeing you there!